It's hard to avoid licensed characters when Disney Princesses are on water bottles and band-aids, Winnie the Pooh is all over diapers, and Dora the Explorer is on, well, everything. My problem with these licensed 'spokes characters' is that they're used to sell to children and their images often attributed to cheap, plastic toys and products that will eventually end up in a landfill. We've avoided these types of toys entirely (although I was sold on a Piglet toothbrush) but I know that as Eloise grows it will become more difficult. And should I really care if a pair of underwear with Elmo's likeness make Eloise happy? I also must admit when it comes to licensed characters I find Sesame Street sort of irresistible. Sesame Street - or simply 'Street' as Eloise calls it - is a very sweet tv show. I like that it has been on since I was a child and that some of the videos played throughout the show may very well be ones I watched. Beyond Sesame Street's nostalgic charm, it is educational, entertaining and best of all, it lasts for a whole hour - that's enough time to make dinner AND clean the kitchen! Like so many kids Eloise is captivated by Elmo and if we're ever going to branch into licensed characters, it could definitely be worse than the little red dude. I'm talking about you D-d-d-d-Dora. I spotted a very cute Elmo peep at Chapters and thought it might make a nice Christmas gift for Eloise. 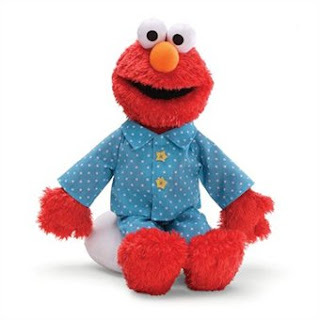 He's wearing polka-dot jammies and has that classic Elmo smile but thankfully, no sounds or movements. I'm definitely not ready, nor willing, to make the jump into the laughing, moving version. What do you think about licensed characters? Is it excusable if they come from a book rather than a tv show? Have a read of this article on Apartment Therapy.